Sri Lanka’s foreign minister recently delivered a strong speech in Geneva. Can the government match words with action? On Monday at the UN Human Rights Council (HRC) in Geneva, Sri Lanka’s foreign minister, Mangala Samaraweera, laid out the broad contours of the government’s plan regarding reconciliation, truth and justice. Those who are sceptical about Sri Lanka’s ability to transform as a nation, and address all these issues, are many. They claim that there can never be justice in Sri Lanka; that there can never be recognition of all communities as equals. All I have to say to them is: look at what the people achieved on the 8th of January. The world had given up hope on Sri Lanka to such an extent that very few believed that what was achieved through democratic means on that day was within the realm of possibility in my country. This feat was repeated on the 17th of August when extremists on both sides of the divide failed to secure seats in Parliament. Therefore, I say to the sceptics: don’t judge us by the broken promises, experiences and u-turns of the past. Let us design, define and create our future by our hopes and aspirations, and not be held back by the fears and prejudices of the past. Let us not be afraid to dream. Let us not be afraid to engage in meaningful dialogue aimed at finding solutions to problems as opposed to pointing fingers, heaping blame and scoring political points at the expense of future generations. Samaraweera is a smooth operator and this was a strong speech. Colombo has laid out its plan with optimism and enough detail (for now anyway) to all but ensure that the forthcoming HRC resolution on Sri Lanka will be crafted through a collaborative, friendly process. This Wednesday, the UN Office of the High Commissioner for Human Rights (OHCHR) report, focused on wartime abuses in Sri Lanka, will be made public. Yet, unlike the past several years during Mahinda Rajapaksa’s reign, the discourse about the island nation at the HRC won’t be dominated by opprobrium and animosity. While the positive changes that Sri Lanka has made since January have not gone unnoticed, the foreign minister’s speech on Monday was far more ambitious than that. Are these wide-ranging, deep reforms actually possible in Sri Lanka today? Is a domestic mechanism really the way to go? 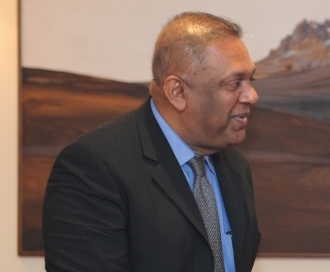 Samaraweera’s words definitely will not convince everybody – especially the Tamil community. There are many reasons to be skeptical about the government’s plan – starting with the fact that Sri Lanka’s history as it relates to commissions of inquiry and accountability has been characterized by serious political meddling and institutionalized impunity. Colombo is getting the diplomacy right; that’s for sure. Yet, when it comes to the tough issues, whether the new government can match words with actions remains an open question.